Last night was supposed to be my last night on Koh Tao. Today I was supposed to go to Koh Phangan on the 9am boat taxi I scheduled for $12. When I checked out this morning I was supposed to get my $16 key deposit back. It turns out all of those things are supposed to happen tomorrow. Perhaps because the days and numbers of the week have become largely irrelevant to me, or perhaps it was a complete oversight on my part. 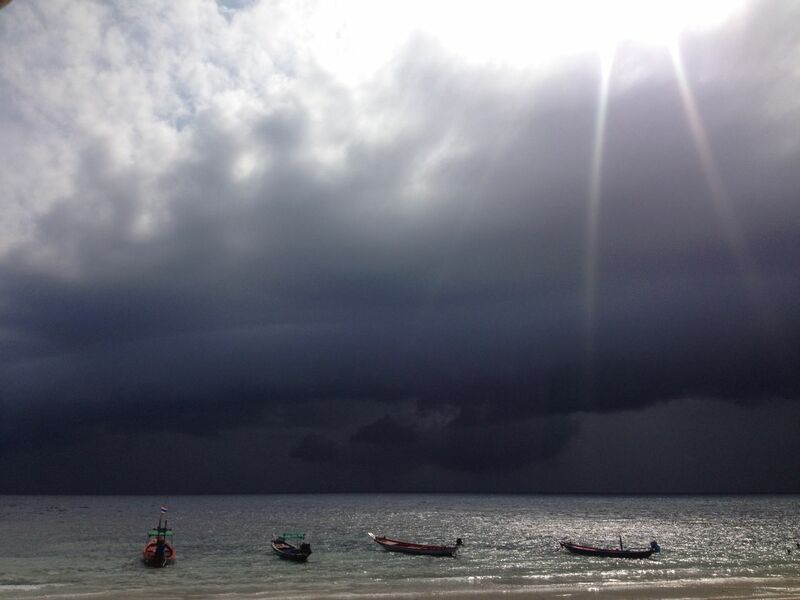 Either way, today is my last day on Koh Tao …part 2. Not quite ‘Groundhog’s Day’, it’s certainly like getting a do-over on a day that you thought you closed the chapter on. So what am I doing? At the moment I’m sitting in a cafe with Wifi that doesn’t work. Oh they said it worked. I even put the password (New Heaven) into my phone and saw that it attempted to logon. The two people next to me are online. I was online here a few days ago. Today – no internet for you. (Cue Soup Nazi) I would leave, but I started a process on my computer that is supposedly going to take 45 minutes. It says it’ll be done in 9, but I’m fairly sure there is another process that happens after those 9 are up that will take an equally long amount of time. It’s not that I’m being held captive here – but I set out to do a specific set of tasks that involved the internet and instead now I’m reading a book. And watching a dog lick himself. After about a minute he’s tired and out of breath. He looks to be part Pit-bull and possibly a little of something else. I think a long time ago he was black and white, but today he’s covering the cooled concrete floor of this place as a mix of grey and white splotches. I’ve seen this dog all over the island over the last few days, and stray or not he’s extremely well fed. Later in the day I was on the beach and a storm was coming in. It’s rainy season here in Thailand – especially on the east side. I found a bar to hide from the rain from, since it didn’t seem like a bad idea to sit on the beach and watch the storm come in. Sitting at the bar watching it rain led to hanging out in the pool with people in the rain. Those people eventually led to meeting around 8 for dinner, drinks and dancing on the beach until 3am, a filthy pool of half naked people until around 5am, and eventually going to bed at 5:30am so later wake up at 7 to start getting ready for a 9am taxi. Sometime in the next few days on Koh Phangan I’m supposed to meet back up with those people and we’ll most likely stay out late a few more times. Overall – my actual last night on Koh Tao was much better than the first one. This entry was posted in Thailand, What's up with Mike. Bookmark the permalink. ← Flaming Raving. Beach Bums. Dancing Queens. Doesn’t sound like you miss those fun filled work days you used to have……… Love you, please be safe.